"Fro beer!" 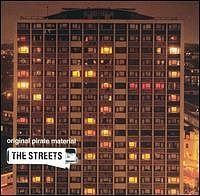 Yells the Streets' 23-year-old Mike Skinner. "If you fro yer beer, I'll give you a new one", he shouts to the rowdy crowd; swinging his beer rapidly around his head--emptying the contents of his Sam Adams like a frothy lasso, covering his backing band (as well as concert-goers), who grin sheepishly and wipe their instruments down. It seems that this has happened before. Britain's answer to Eminem has arrived. 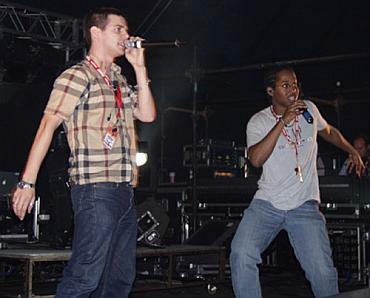 That's right, Mike Skinner (coincidentally white, like Eminem, minus the baggy pants) alongside sidekick Kevin Mark Trail, make up England's first rap export. During the course of this particular evening at The Streets gig at The El Rey, head man Skinner is pelted with a wide array of items (including ice and beer), is offered a toke and given a tab of X, none of which seems necessary given the sheer exuberance of his performance. Listening to the lyrical intricacy of his debut album "Original Pirate Material", there was some question as to how he would present the tales of two-day lager binges and South London chip shop (more commonly known here as a burger joint) food fights to the notoriously leaden LA crowd. However, Skinner's performance, straight from the opening bars of "Has It Come To This?" showed that this was a performance of a young man whose time has come. Skinner, who looks slightly like Ewan MacGregor's Renton from "Trainspotting", the shaven-headed and frighteningly new-born looking "geezer" (British equivalent to "dude") came across as a man with too much to say and not enough time to say it. "This ain't your archetypal street sound," he states during "Let's Push Things Forward", the broken-rhythm dance-hall/hip-hop single that blended beautifully into the source material of "Ghost Town" by The Specials. "Sharp Darts," an energetic lyrical tongue-twister ended up as Nelly's "Hot In Herre," pushing his backing band of bass, drums and keys to nail down beats that ranged from hip hop to reggae to UK garage and back again. "It's Too Late" showcased the vocal talents of Skinner's sidekick, the adorable and talented Trail, one of the few black people in the sold out venue, which housed a crowd mostly composed of white-bread Anglophiles and young hipsters. "They were better dancers in Chicago" he taunts during "Too Much Brandy," whipping up the crowd with an air horn and pulling up a couple of girls to pour beer over each other's heads. "Don't mug yerself, LA, don't mug yerself!" shouts Skinner, sauntering back onto stage for an expected encore. Skinner and Trail offer the apocalyptic "Stay Positive" and the inevitable "Weak Become Heroes." Wise beyond his years, and fresh-faced enough to relish in the hedonism, Mike Skinner might just sound different enough to belie his claim that he produces "cult classics, not best sellers." And although The Streets may be England's answer to Eminem, Skinner has a much more lighthearted approach to his rhymes, fusing together astute government observations, but also waxes rhapsodically about birds (girls) and the joys of marijuana. So maybe it was a bit difficult to understand many of his uses of British street vernacular, but the LA crowd that filed out of the El Rey that night knew that they had witnessed something joyful and resonant, even if they didn't understand everything he was saying.